I love the quote written above by Dame Jaqueline Wilson (author of the Tracey Beakers Books).A question we can all ask ourselves is how many of us read books as we were growing up as a child that showed images of different abilities, race, and religious beliefs? 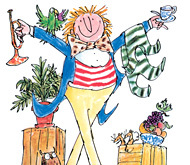 How many of us grew up surrounded by books that reinforced the fact that life is all about being white and healthy, and living in the stereotypical family set up of 2 parents, a cat and a dog etc?How many of us have never read a book where one of the characters was in a wheelchair, or hearing/visually impaired) – i know i never did, and i also never read one to my children,although i know i have brought them up to be totally accepting of all abilities, disabilities, race and gender, and am proud to say that they show no signs of discrimination at all…but can we say that for all of our children? As far as race is concerned we all know that times have changed, and that as we welcome more and more different cultures across our borders, we now have the benefit of living in a multi cultural society,this can also benefit our children as they get the opportunity to learn about other races and cultures, but i feel we need to make sure that we are also representing this in our children’s books. promote equality of opportunity and good relations between people of different racial groups. With the birth of the Disability Discrimination Act (1995/2005) we are all made clear the roles we play, and the responsibility we carry if we are to produce literature, images/illustrations etc for the benefit of the general public. The Disability Discrimination Act 1995 (DDA) addresses the obstacles which many disabled people experience in everyday life: in employment; access to goods and services; transport; and education. As an employer, provider of a service to the general public, or education provider you have a duty to make reasonable adjustments in anticipating the needs of disabled people. As far as i can see one of the many rights of a disabled person is to be accepted alongside able-bodied people, with their rights being as important as everyone else, and for them to be represented within stories and such like, and their stories told. I think it is important though that we do not patronise, or indeed highlight peoples differences in a condescending manner, but to just to be inclusive, and to show society as it really is. It has always helped my children for them to be told about disabilities, and for me not to tolerate either of them joining in with others and poking fun at those less fortunate than themselves, but to explain things in the hope that they will grow up to be compassionate and caring individuals, which i am proud to say they are! 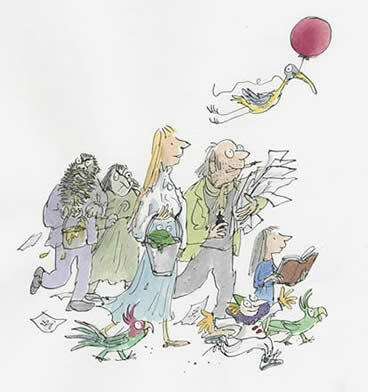 Quentin Blake is one of the modern authors/illustrators who has made a point of being inclusive, and on looking at the image below you can see that unless you looked hard you wouldn’t instantly see the child as being disabled, it is just a normal child…… which of course she is!! I came across some illustrations by a Japanese arttist called Setsu Nagasawa. 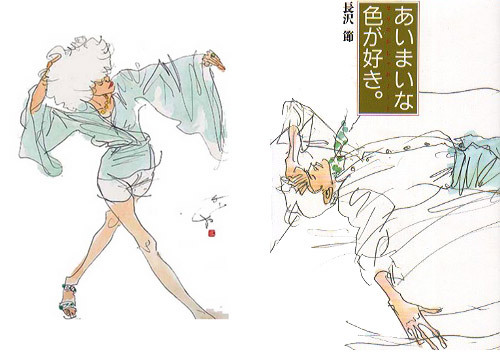 Sadly he died in 1999, but he is still one of the most well known fashion illustrators in Japan. The majority of Setsu’s works are pencil line drawing with watercolor. His lines are simple, but flowing and full of emotion. As an illustrator (trainee) i love the quickness of line and wash, and the movement created by what is left out, rather than what is put in. As a young girl, aged 16 or so, i found myself very drawn to the Japanese style of illustration, and so it seems fit that i would now find it influences me in my own work. It’s then interesting to look at some of Quentin Blakes worka nd wonder if he was also influenced by this style? 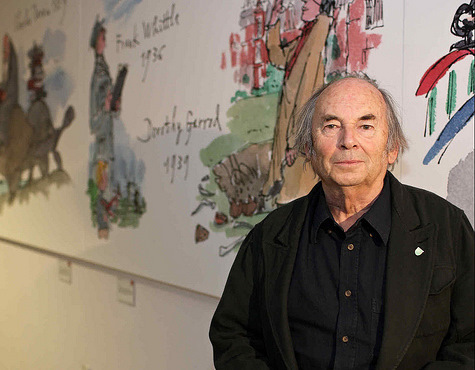 Quentin Blake – an awesome illustrator! I love his loose style, his pen and ink quick drawings that he splashes with watercolour – regardless of the boundaries of the line, and i love the detail that is incorporated into his pictures that i think truly captures the child’s imagination (and i am sure that is why he is so popular with children) for instance in the ‘Cockatoos’ book where the Cockatoos hide in all of the pictures, and you have to look and find them – children love this…and so do i! !